(Seychelles News Agency) - Cooperation in trade and the economy are two areas that Seychelles and Pakistan will work together on, said the newly accredited Pakistani High Commissioner on Tuesday. The newly accredited High Commissioner for Pakistan to Seychelles, Syed Ahmed, spoke after he presented his credentials to President Danny Faure at State House, Victoria. “Pakistan and Seychelles already have a good and strong political relation, but I think that the economic and trade relations are not to the extent that is reflective of our political commitment,” said Ahmed. To help move cooperation in trade further, Ahmed wishes to meet with concerned people in the area. He added that it is in his mandate to bring the two countries together and as a result will put his focus on trade, finance and training. The Central Bank of Seychelles announced last year that the local Habib Bank branch will cease operations and close on February 28. This came after the management of Habib Bank Limited has advised that the decision to close down the business is based on the strategic reorganisation being undertaken by the bank. “I am sure that discussion had already taken place between the bank and the Seychelles Authorities,” he added. Diplomatic relations between Seychelles, an archipelago in the western Indian Ocean, and Pakistan were established in June 1976. 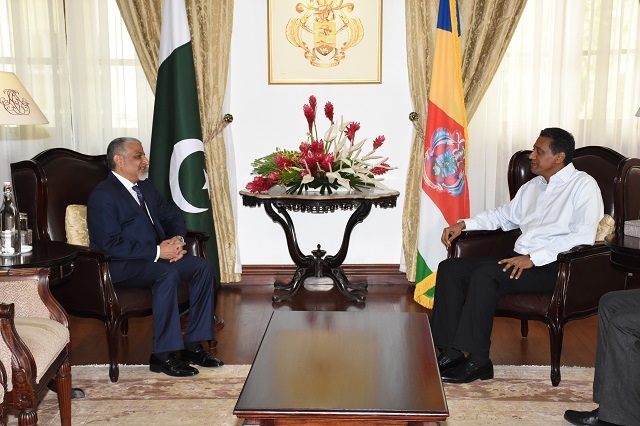 The third Pakistani High Commissioner to Seychelles further added that, though specific details have not yet been outlined as part of strengthening bilateral relations, instructions given by President Faure have been noted. After his dialogue with Faure, Ahmed met with Vice-President Vincent Meriton. The newly accredited High Commissioner will be based in Port Louis, Mauritius.